Seven per cent of the Australian workforce is employed in public administration and safety. Every year the industry accounts for about 9720 workers’ compensation claims (8%) and eight work-related fatalities (4%). other public order and safety services. This sector incorporates extremely diverse work and this needs to be acknowledged when identifying workplace measures. Males made up 52% of public administration and safety workers. The fatality rate for workers aged 65 and over was seven times more than the industry average (8.7 versus 1.2 fatalities per 100,000 workers). View the Public administration and safety: Priority industry snapshot for an overview of the industry and its WHS performance. Table 1: Key work health and safety statistics for the public administration and safety industry, 2009–10 to 2013–14 combined. * Fatality numbers and rates concern the period 2010–14. Public administration and safety workers who were compensated for mental disorders tended to be off work for longer compared to the average for all industries. Between 2010–14, the proportion of mental disease claims with 52 weeks or more lost from work was higher in public administration and safety (30%) compared to all industries (22%). Figure 1: Proportion of mental disorder claims by duration of absence, 2010–14. In addition, the median payment for a mental disorder claim in public administration and safety was $39,000 compared to $23,000 for a similar type of claim across all industries, over the surveyed period. Between 2010–14, police officers were one of the occupations with the highest rates of workers’ compensation claims (36%) for mental disorders, lodging 3,591 claims in total. Within the industry, security officers and guards were next with 311 claims lodged, followed by fire and emergency workers with 292 claims lodged. Compensated work-related mental disorders include conditions such as anxiety, depression and post-traumatic stress conditions. These can arise for example from prolonged and high levels of mental stress or by exposure to a traumatic situation, exposure to violence, harassment or bullying. Workers in some sections of this industry are dealing with members of the public who may be in distress and or violent. 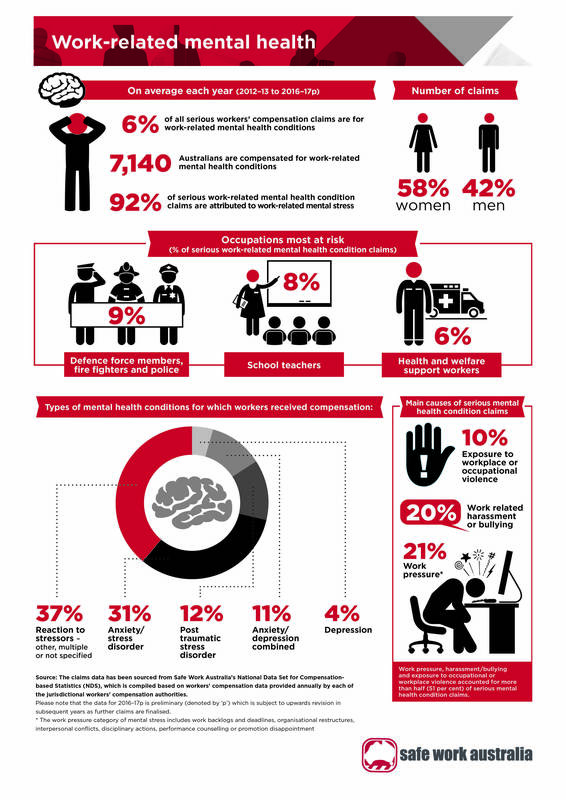 The emotional demands and threats to worker safety are some of the reasons for the proportionally higher numbers of compensated work-related mental disorders (psychological injuries). Between 2010–14, claims for mental disorders were almost three times more common (17%) compared to other industries (6%). Fire fighters, police officers, guards and security officers are some of the occupations with the highest rates of workers’ compensation claims for diseases of the circulatory system (stroke, coronary artery disease, hypertension and heart failure). • Between 2010–14, 36 claims were lodged by police (20), fire and emergency workers (14) and security officers and guards (2). Firefighters are faced with unique working conditions that increase their risk of exposure to carcinogenic chemicals and substances. Between 2010–14, fire and emergency workers lodged 31 claims associated with chemicals and chemical products. This represented 9% of the total number of claims submitted nationally (328) related to chemicals and chemical products. The public order and safety services industry group accounts for almost half of fatalities in public administration and safety. Between 2010–14, eight (19%) fire protection and other emergency services’ workers died due to work-related causes, and seven (17%) were in the police. Police officers, fire and emergency workers, and security officers and guards made up one third of fatalities in public administration and safety each year. The Australian Work Health and Safety Strategy 2012–2022 has identified the public administration and safety industry as a priority to reduce the high number of work-related fatalities, injuries and illnesses. 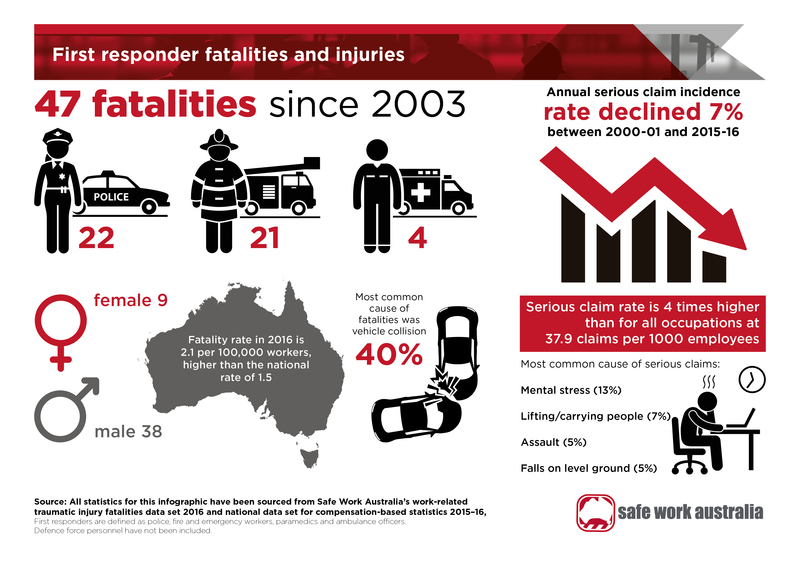 The public administration and safety industry records around 10,000 serious claims per year, which accounts for 8% of the total number of serious claims in Australia. The Strategy aims to reduce the incidence of serious injury by at least 30% nationwide by 2022, and reduce the number of work-related fatalities due to injury by at least 20%. The public administration and safety industry will play a critical role in meeting these targets. 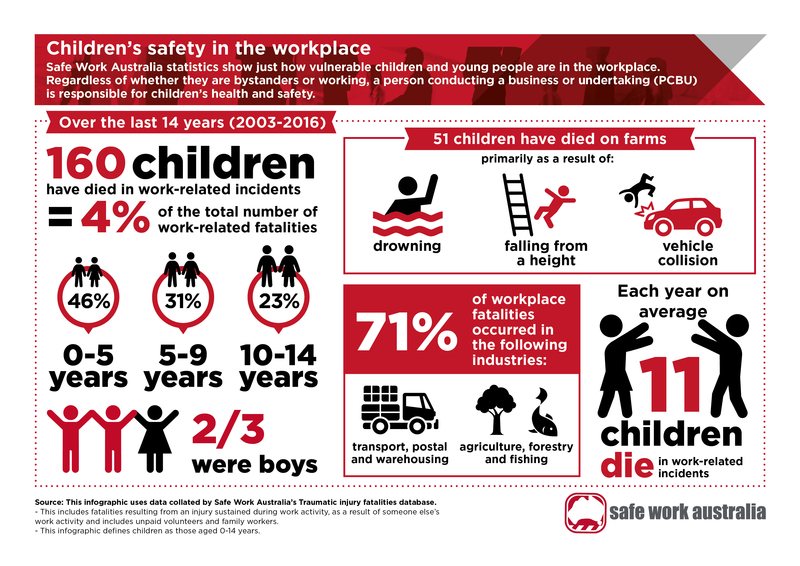 Since the Strategy launched, Safe Work Australia and all jurisdictions have been working collaboratively with the industry, unions, relevant organisations and the community to reduce fatalities and injuries in the public administration and safety industry. SWA is not a regulator and cannot advise you about public administration and safety compliance. If you need help, please contact your state or territory work health and safety authority. Security guard Gail shares the work safety tactics that she goes through every day to keep herself and her colleagues safe. 9720 workers’ compensation claims each year are in the public administration and safety industry. 3 times more mental disorder claims in the public administration industry (17%) than other industries (6%).